To maintain good health, the quantity of acidic foods in the diet needs to me monitored. To continue good health, the diet should consist of 60% alkaline forming foods, and 40% acidifying foods. To restore health, the diet should consist of 80% alkaline forming foods, and 20% acidic foods. See Alkaline Diet for more detailed information. To neutralize a glass of cola with a pH of 2.5, it would take 32 glasses of alkaline water with a pH of 10. In combination with water, your body will draw calcium and magnesium from the bones to buffer an acidic diet. Remember...it's not the actual pH of the food itself that concerns us, but rather the effect it has on the body when metabolised. Corn; Lentils; Olives; Winter Squash. Blueberries; Canned or Glazed Fruits; Cranberries; Currants; Plums**; Prunes**. **These foods leave an alkaline ash but have an acidifying effect on the body. Amaranth; Barley; Bran, oat; Bran, wheat; Bread; Corn; Cornstarch; Crackers, soda; Flour, wheat; Flour, white; Hemp Seed Flour; Kamut; Macaroni; Noodles; Oatmeal; Oats (rolled); Quinoa; Rice (all); Rice Cakes; Rye; Spaghetti; Spelt Wheat; Germ Wheat. Almond Milk; Black Beans; Chick Peas; Green Peas; Kidney Beans; Lentils; Pinto Beans; Red Beans; Rice Milk; Soy Beans; Soy Milk; White Beans. Butter; Cheese; Cheese, Processed; Ice Cream; Ice Milk. Cashews; Legumes; Peanut Butter; Peanuts; Pecans; Tahini; Walnuts. Bacon; Beef; Carp; Clams; Cod; Corned Beef; Fish; Haddock; Lamb; Lobster; Mussels; Organ Meats; Oyster; Pike; Pork; Rabbit; Salmon; Sardines; Sausage; Scallops; Shellfish; Shrimp; Tuna; Turkey; Veal; Venison. Avocado Oil; Butter; Canola Oil; Corn Oil; Flax Oil; Hemp Seed Oil; Lard; Olive Oil; Safflower Oil; Sesame Oil; Sunflower Oil. Beer; Hard Liquor; Spirits; Wine. Catsup; Cocoa; Coffee; Mustard; Pepper; Soft Drinks; Vinegar. Aspirin; Chemicals; Drugs, Medicinal; Drugs, Psychedelic; Herbicides; Pesticides; Tobacco. Beer: pH 2.5; Cola: pH 2; Coffee: pH 4. 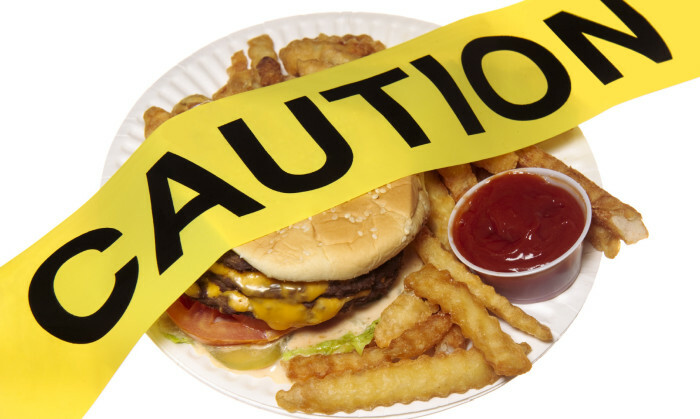 Fastfood is acidic as well as being loaded with sugar and saturated fats. Amendment 1: You may come across lists that have included green peas in both acidic foods and alkaline lists. Green Peas are acidic according to Dr. Susan Brown and Dr. Russ Jaffe. Sources include USDA food database (Rev 9 & 10), Food & Nutrition Encyclopedia, Nutrition Applied Personally, by M. Walczak; Acid & Alkaline by H. Aihara. Amendment 2: According to Dr. Susan E. Brown and Larry Trivieri, Jr. authors of the Alkaline-Acid Food Guide, soy products are acid forming. Only the fermented forms (miso, tamari) are alkaline forming. Forget about replacing cow’s milk with soy milk (cow’s milk is only mildly acidic). In contrast, whey protein powder is mildly alkalizing.